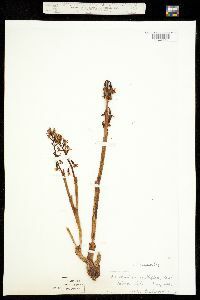 Stems ± strongly thickened, base not bulbous. Inflorescences: racemes dense to lax, 10-65 × 1.5-6.5 cm. Flowers 6-41, conspicuous; perianth open; sepals directed forward to somewhat spreading, brown, tan, red, or yellow, often darker distally, lanceolate, 3-veined, 4.7-15 mm; petals frequently curved toward column, nearly adhering to it, tan to yellowish, often red distally, usually spotted with purple, lanceolate to oblanceolate, 4.5-11.5 mm; lip white, usually spotted with purple, obovate to elliptic, thin, lateral lobes 2, rounded, middle lobe oblong to broadly dilated toward apex, with 2 distinct basal lamellae, 4-9 × 1.5-6 mm; column whitish yellow, spotted with purple, usually curved, 3.3-7.8 mm, basally with ridges or poorly developed auricles; ovary 5-14 mm; mentum obscure, adnate to edge of ovary. Capsules pendulous, ellipsoid, 9-24 × 5-9 mm. 2n = 42. Several color forms exist in Corallorhiza maculata, often occurring in proximity and sometimes forming large clumps. White-flowered southern plants have occasionally been misidentified as Corallorhiza trifida. Dance-flies (Empis) have been reported as pollinators (J. L. Kipping 1971). Perennial mycotrophic (saprophytic) herb 15 - 60 cm tall Leaves: none. Inflorescence: a single, erect, terminal, long-stalked, elongate, loose, spike-like cluster of six to twenty, thick-stalked flowers with each flower subtended by an obscure, 0.5 - 9 mm long, 0.5 - 1 mm wide bract. Flowers: purple-brown to clear yellow, usually with dark spots, about 1 - 3.5 cm wide, bilaterally symmetric with spreading sepals and petals, and one petal formed into a lip, but lacking a spur. The reproductive parts of stamens, stigma and style are fused into a 3.3 - 5.5 mm long column above the 0.5 - 1 cm long inferior ovary. Column curved, whitish yellow, spotted with purple, and 0.7 - 1 mm wide at stigma. Sepals: three, somewhat spreading, petal-like (larger than petals), brown to red or yellow (often darker near tips), 0.5 - 1.5 cm long, 1 - 2 mm wide, lance-shaped to linear, and with three lengthwise veins. 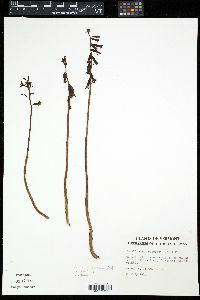 Petals: three, with upper two usually curved forward above column. The two lateral petals are 0.5 - 1.2 cm long, 1 - 2 mm wide, linear to more lance-shaped, yellowish purple to tan, often red toward the tips, and usually spotted with purple. Lip 0.3 - 0.7 cm long, 1.5 - 4.5 mm wide, white and spotted with purple or crimson, elliptic to inversely egg-shaped but with three lobes. The two basal lateral lobes of the lip petal are small, rounded, slightly inrolled, and directed forward, while the large central lobe is oblong with two lengthwise ridges (lamellae) below the middle, and the tip expanded slightly or not at all. Fruit: several, stalked, drooping, 0.9 - 2.4 cm long, 0.5 - 0.9 cm wide, ellipsoid capsules with three lengthwise ridges, and remnant floral parts at apex. 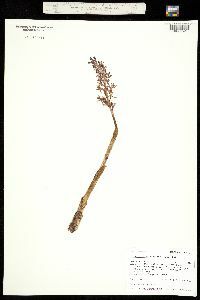 Flowering stem: single, erect, hairless, somewhat fleshy, light brownish purple to yellowish, lacking leaves, but with a few, closed, tubular sheaths. This leafless structure terminated by flowers is called a scape and technically is not a true stem. 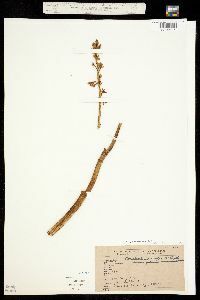 Root system: lacking true roots, but with multiple-branched, coral-like rhizomes. Similar species: There are two varieties of Corallorhiza maculata in North America, but only the typical variety, as described above, occurs in the Chicago Region. The other variety, C. maculata var. occidentalis, has longer floral bracts (1 - 2.8 mm) which are typically forked, the apex of the middle lobe of the lip is distinctly expanded or widened more than 1.5 times the width at its middle, the ovary is usually longer (0.9 - 1.3 cm), and the flowering stem tends to be more stout. The most similar species in our area is C. trifida since it too has small lateral lobes on the lip petal and the lateral sepals do not curve up, but it differs by having only one vein on each sepal instead of three, it tends to be a shorter plant (only to 15 cm), it is found in wetter habitats such as bogs or swamps, and it blooms earlier (completed by June). Another species that blooms at a similar time as C. maculata is C. odontorhiza, but it can be distinguished by its flowers since the lip petal is not lobed, and the sepals and lateral petals point forward and are closely appressed to each other giving the appearance that the flowers are not fully open. Habitat and ecology: Uncommon, in upland mesic to dry-mesic woods such as oak or beech-maple woodlands. It is unable to tolerate dense shade as in mature forests, and populations have been known to increase or even reappear after burns. Notes: There are two varieties of C. maculata in North America and the ranges overlap to the north of the Chicago Region, but we only have the typical variety, C. maculata var. maculata. The other variety, C. maculata var. 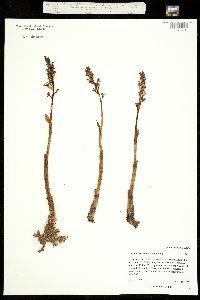 occidentalis, has been reported in very northern Michigan and Wisconsin, as well as a few isolated areas along the Mississippi River in central and southern Illinois. There are several color forms throughout the range of the species, and these different colored populations sometimes form large clumps. In fact, variations in color are quite common throughout the genus. Since this is a mycotrophic genus (dependent on fungi for nutrients and non-photosynthetic), none of the species are green and they all lack leaves. Apparently various genera of fungi are know to associate with the species of Corallorhiza. Etymology: Corallorhiza comes from the Greek words korallion, meaning coral, and rhiza, meaning root, in reference to the branching, underground rhizome, which has a similar appearance to coral. Maculata means spotted, which refers to the purplish spots on the flowers. Stem 2-6 dm, often pinkish-purple; infl 5-15 cm, fls 10-40; sep and lateral pet narrowly oblong to oblanceolate, 6-8 mm, 3(5)-nerved, the lateral sep somewhat divergent, the lateral pet ±spotted or suffused with purple; spur a prominent, sometimes divergent swelling near the ovary-tip; lip 6-8 mm, white, generally purple-spotted, with 2 rather small but evident lateral lobes below the middle and 2 short parallel ridges on the face, its terminal lobe rounded and deflexed, 3-4 mm wide. Woods; Nf. and Lab. to B.C., s. to Md. and Ind. and in the mts. to N.C., in the west to Mex. and C. Amer. July-Sept.